Circa: 1870's Manufacturer: Bryce Brothers Originally attributed to Bryce Bros. circa the 1870's Sharp Oval & Diamond and Granby, this pattern was later produced by U. S. Glass circa 1898 as one of the States patterns and popularly known as Louisiana.This is a beautiful high standard cake stand with the pattern repeated on the foot as well as the plate. The stand measures 9 1/2" wide and 6 1/4 " high.The cake stand is in excellent condition, free of any chips, cracks or discolorations. 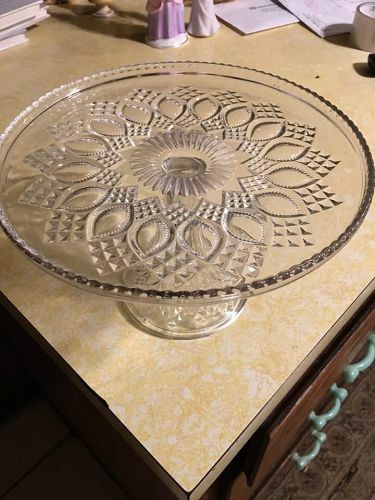 Circa: 1897 U. S. Glass EAPG Louisiana pattern cake stand. This is another attractive States pattern produced by U.S. Glass about 1898. It is free of any chips, cracks or discolorations or scratches. Simply gorgeous!